Even the moon celebrates Mom’s birthday! Tomorrow, March 19, is Candace’s birthday, and the Full Moon will be at the point on its elliptical orbit that is closest to the Earth. This nearest point is called the perigee. On March 19th, a full Moon of rare beauty* will rise in the east at sunset. It’s a super “perigee moon” – the biggest in almost 20 years. “The last full Moon so big and close to Earth occurred in March of 1993,” says Geoff Chester of the US Naval Observatory in Washington DC. 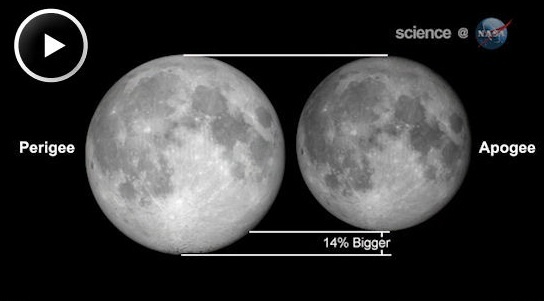 “I’d say it’s worth a look*.” Full Moons vary in size because of the oval shape of the Moon’s orbit. It is an ellipse with one side (perigee) about 50,000 km closer to Earth than the other (apogee). Nearby perigee moons are about 14% bigger and 30% brighter than lesser moons that occur on the apogee side of the Moon’s orbit. And to top off all that, March 19 is still technically winter, and Full Moons during the winter seem brighter because they occur at a higher altitude in the sky than Full Moons in the summer. So tomorrow night at sunset or shortly thereafter, when you see the particularly bright Full Moon rising, join the Moon and stars in wishing Candace a very happy birthday! UPDATE: We had a wonderful time this evening enjoying the rising Moon above the waters of Thunderbird Lake, east of town, with all three daughters and our son-in-law, following upon the Troupe’s participation in the Oklahoma City St. Patrick’s Day parade earlier in the day. A very beautiful night – the clouds just added character to the changing appearances of the Moon over the water. We could feel the Earth turning beneath our feet, and the months and years flying by in a joyous Irish dance. This entry was posted in Family, Nature and tagged Astronomy. Bookmark the permalink. We will be looking at the lovely moon tonight and definitely want to send Candace many happy birthday wishes! !